While one can indeed approximate according to the spherical cow, in terms of events in the cosmos, I was being more specific when it comes to demonstrating a geometrical feature of the sphere in terms of the geometry of the Centroid. This feature is embedded in the validation of the sphere in regard to gravity? 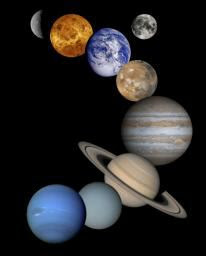 It was important to see how such planets form and given their "Mass and densities" which I thought to show how such a valuation could be seen in relation to the variance of gravity so it is understood. Isostasy (Greek isos = "equal", stásis = "standstill") is a term used in geology to refer to the state of gravitational equilibrium between the earth's lithosphere and asthenosphere such that the tectonic plates "float" at an elevation which depends on their thickness and density. This concept is invoked to explain how different topographic heights can exist at the Earth's surface. When a certain area of lithosphere reaches the state of isostasy, it is said to be in isostatic equilibrium. Isostasy is not a process that upsets equilibrium, but rather one which restores it (a negative feedback). It is generally accepted that the earth is a dynamic system that responds to loads in many different ways, however isostasy provides an important 'view' of the processes that are actually happening. Nevertheless, certain areas (such as the Himalayas) are not in isostatic equilibrium, which has forced researchers to identify other reasons to explain their topographic heights (in the case of the Himalayas, by proposing that their elevation is being "propped-up" by the force of the impacting Indian plate). In the simplest example, isostasy is the principle of buoyancy observed by Archimedes in his bath, where he saw that when an object was immersed, an amount of water equal in volume to that of the object was displaced. On a geological scale, isostasy can be observed where the Earth's strong lithosphere exerts stress on the weaker asthenosphere which, over geological time flows laterally such that the load of the lithosphere is accommodated by height adjustments. Such strength variances can be attributed to the height with which this measure is taken(time clocks and such) and such a validation in terms of Inverse Square Law goes to help to identify this strength and weakness, according to the nature of the mass and density of the planet. As one of the fields which obey the general inverse square law, the gravity field can be put in the form shown below, showing that the acceleration of gravity, g, is an expression of the intensity of the gravity field. It is important then such a measure of the energy needed in which to overcome the pull of the earth, then was assigned it's energy value so such calculations are then validated in the escape velocity. 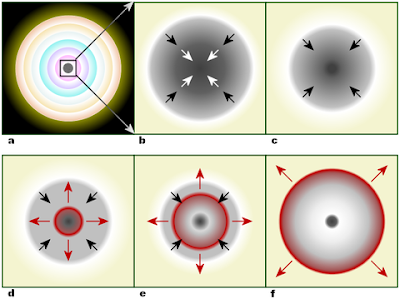 There are other ways in which to measure spots in space when holding a bulk view of the reality in regards to gravity concentrations and it locations. John Hoyer Updike (18 March 1932 – 27 January 2009) was an American novelist, poet, short story writer, art critic, and literary critic. Updike's most famous work is his Rabbit series (Rabbit, Run; Rabbit Redux; Rabbit Is Rich; Rabbit At Rest; and Rabbit Remembered). Both Rabbit is Rich and Rabbit at Rest received the Pulitzer Prize. Describing his subject as "the American small town, Protestant middle class," Updike was widely recognized for his careful craftsmanship, his highly stylistic writing, and his prolific output, having published more than twenty-five novels and more than a dozen short story collections, as well as poetry, art criticism, literary criticism and children's books. Hundreds of his stories, reviews, and poems appeared in The New Yorker, starting in 1954. He also wrote regularly for The New York Review of Books. His work attracted a significant amount of critical attention and he was considered one of the most prominent contemporary American novelists. Updike died of lung cancer on January 27, 2009. Current knowledge and scientific discovery help to align our thinking. They help us to recognize what had been "set in stone" in literature, as a passing thought in that day of poetry creation. So every progression in terms of knowledge has it's predecessors, and from that, the old and the new contrast each other. We know a little more. By classifying the neutrino interactions according to the type of neutrino involved (electron-neutrino or muon-neutrino) and counting their relative numbers as a function of the distance from their creation point, we conclude that the muon-neutrinos are "oscillating." Oscillation is the changing back and forth of a neutrino’s type as it travels through space or matter. This can occur only if the neutrino possesses mass. The Super-Kamiokande result indicates that muon-neutrinos are disappearing into undetected tau-neutrinos or perhaps some other type of neutrino (e.g., sterile-neutrino). The experiment does not determine directly the masses of the neutrinos leading to this effect, but the rate of disappearance suggests that the difference in masses between the oscillating types is very small. The primary result that we are reporting has a statistical significance of more than 5 standard deviations. An independent measurement based on upward-going muons in the detector confirms the result at the level of more than 3 standard deviations. A generalization of a voxel is the doxel, or dynamic voxel. This is used in the case of a 4D dataset, for example, an image sequence that represents 3D space together with another dimension such as time. In this way, an image could contain 100×100×100×100 doxels, which could be seen as a series of 100 frames of a 100×100×100 volume image. 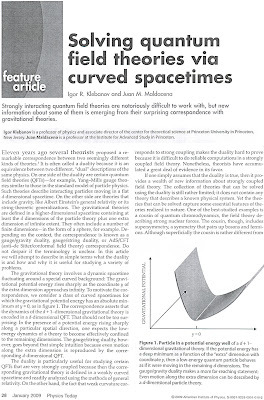 Although storage and manipulation of such data uses a lot of computer memory, this allows the study of spacetime systems. There is a discussion over at Backreaction called, Conservative solutions to the black hole information problem It deals with a paper her and Lee Smolin wrote together. Submitted on 20 Jan 2009) Abstract: We review the different options for resolution of the black hole loss of information problem. We classify them first into radical options, which require a quantum theory of gravity which has large deviations from semi-classical physics on macroscopic scales, such as non-locality or endowing horizons with special properties not seen in the semi-classical approximation, and conservative options, which do not need such help. Among the conservative options, we argue that restoring unitary evolution relies on elimination of singularities. We argue that this should hold also in the AdS/CFT correspondence. It is important that one is set up in terms of progressing to the determination and explanation of the voxel in the context that Holography. Susskind uses it in the way one can interpret "the bit" of information. Where were you in 1969 or ....? I was twelves years old then. My oldest brother was making the journey with some of his friends. Some will identify this to the hippies of a generation. I was hanging out around that time with these groupies, and worked in a "whole earth store" as I got older. Names like Pink or Flower were not that uncommon. Years later after going back home and visiting the ole neighbourhood, what was larger then life in my youth, seemed small and constricting. Somehow then, it seem so much bigger. Your contrasting the past with today. Who doesn't. There is a reason I am relaying this. It is setting the stage for a story that came to me the other morning as I was rousing from my sleep. It is important that I go back to around that time and try and capture some of the prevailing context of that era. To remind people, that we all identify using this framework in terms of remembering. That we can say, that the world holds a special meaning to each of us, by recalling times from that past. It doesn't have to be 1969, but 1980 if you so wish. It's about remembering your youth. How is it one can capture the textual meaning of our youths and reference them in context of todays world now that we have grown up to become who we are. I would bet there are markers in your life that have great meaning to you. These markers are fundamental changes that took place. These markers ignited attributes of who you are to become through growth. Who've you become today. Science, can never take that away from you. Life has been imprinted in this recording. There is information that allows you to reference back and wonder what made up "all the voices of the things we speak about," holds your perspective in that of our parents, or the parent that raised you. The School education you attained, under what religious denomination you fell under, holding education with a certain view. What we shall never become under the dominance. What we will become after we've been educated. I will be building the story in phases and I will connect each chapter through the links in the url at the bottom of the page as I have been doing in connecting posts. I am hoping that the science part I develop in relation to this story will encourage the scientist to come along and correct the basis of this perspective under a mathematical basis as well as a scientific one. I would like the components to be factual even though the story will be a fictional one. I would like any good people who are willing to spend some money on a good story recognize that the originality of this story would help a man and his wife into retirement. Although not a scientist of the calibre that are spread throughout the site here, it is with some knowledge that I will try and speak as responsible and clear about what has taken me to this point. If not, we will be going into retirement anyway and okay. Collaborators are alway welcome toward the functionality and originality toward that sharing monetarily is not a problem if something were to come of it. By disposition after many years of studying I have come to certain realizations which have formed because of my own life road. This does not mean for you to accept and supplant what this means for you too, other then to encourage you to look at your own life, and wonder as I have, about the meaning of life. What the summation should be after the many years of information that I have travelled through. The story then here is trivial in that it originates "back in time", and comes forward with an idea about events that will unfold currently, in this fictional story. It is important that the inclusiveness of perception once extended sees information in it's unfolding, so that once you arrive at a certain location, one is able to understand how they got there. A lot of times when I speak it is always from a fifth dimensional perspective and these things are already understood in their pictorial forms displayed. So see in term of a quark to quark measure, or a quark in a bag it is the idea of seeing in this way that the values of that spacetime take on interesting images as we apply it over the whole notion of reality as I have even down to a emotive level. It's strength and weaknesses in terms of that gravity. Lagrangian views of the relationships of three body problems as a form this disposition in the cosmos. When looking at the entropic valuation of the way the universe one can just plainly accept the insight that heat when cooled can manifest the objects of that reality. Just simply accept this without thinking about it's finer dispositions? Infinite regress is limited by the very logic presented, and any intention that such probability will play an important part in the outcome. You have to have a lot of information to be able to do this. Pattern recognition then accepts some foundational need for interpretation other then, what one assumes is the basis of the argument, which also is constraint by that limitation. 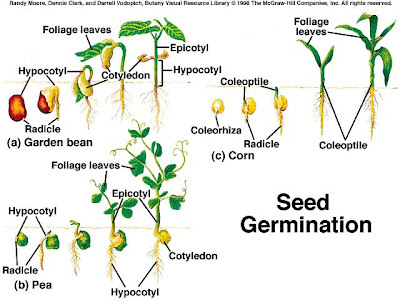 Plants soak up some of the 1017 joules of solar energy that bathe Earth each second, harvesting as much as 95 percent of it from the light they absorb. The transformation of sunlight into carbohydrates takes place in one million billionths of a second, preventing much of that energy from dissipating as heat. But exactly how plants manage this nearly instantaneous trick has remained elusive. Now biophysicists at the University of California, Berkeley, have shown that plants use the basic principle of quantum computing—the exploration of a multiplicity of different answers at the same time—to achieve near-perfect efficiency. While the life cycle is readily apparent, it does not explain the potential nor the expression of how this "motivation came into being." That one can say that there is the subtle and then the gross, and think this is the nature of the world. That by rubbing one's hands and creating friction and heat, they have somehow supplanted the idea as a question about the world and wonder where information fits in. Somehow having the idea of starting a fire "with a cylinder shape," somehow deeper defines the meaning of that question about the information then just hands rubbing. That cylinder, is a measure of the strings value. So the hand rubbing becomes a thing of the world in its scientific notation as the basis of interpretation. One wonders then, how indeed such a thought came to them and thusly, to have express itself as a model of acceptance. We have thusly define the idea in this context of information as something that rests in the probabilistic expression, and that the ideal is something that manifests from such a field of probabilities. The nature here then, is that "any idea has a much finer disposition" then what the ideal represents in reality. After some thinking, how is it one can think that such an abstraction could descend into the modern mind, and think it reveals the idea of nature in expression? It's just an artistic interpretation then, nothing more? The cycle of creativity is an interesting circuit to the droplet form. As an idea and such, a condensible feature of the "subtle and storm gathering" into a distillation of a kind? 5. Regular polytope: If you keep pulling the hypercube into higher and higher dimensions you get a polytope. Coxeter is famous for his work on regular polytopes. When they involve coordinates made of complex numbers they are called complex polytopes. How many crack point numbers for this poetic version? :) Baez's Crackpot index is a joke. Again I try remind good scientists that I have nothing to offer other then trying to keep pace with their thinking, and to find myself in world's of abstraction that I really find interesting. Of course, their metaphors too. You see for me there are interesting correlations of thought that wake me up to the understanding of such abstract thinking, and what purposes it serves. I quote the Pringle Potato Chip to spell out the earlier realization of Maldacena, as well, the idea I have about, the Birth of Approximation. I was trying to tangle with such thoughts in a cosmological sense and here they speak to it in mathematical illustrations. IN their figure 2. Hyperbolic space, and their comparative relation to the M.C.Escher's Circle Limit woodcut, Klebanov and Maldacena write, " but we have replaced Escher's interlocking fish with cows to remind readers of the physics joke about the spherical cow as an idealization of a real one. In anti-de Sitter/conformal theory correspondence, theorists have really found a hyperbolic cow." 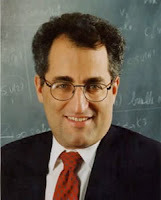 Thank you, too "Just Learning" andDavid Berenstein for the information about the article above. The Cosmic Landscape, Page 339, Para 2. Richard Matthew Stallman (born March 16, 1953), often abbreviated "rms", is an American software freedom activist, hacker, and software developer. In September 1983, he launched the GNU Project to create a free Unix-like operating system, and has been the project's lead architect and organizer. With the launch of the GNU Project, he started the free software movement and, in October 1985, set up the Free Software Foundation. Stallman pioneered the concept of copyleft and is the main author of several copyleft licenses including the GNU General Public License, the most widely used free software license. Since the mid-1990s, Stallman has spent most of his time advocating for free software, as well as campaigning against both software patents and what he sees as excessive extension of copyright laws. 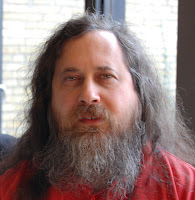 Stallman has also developed a number of pieces of widely used software, including the original Emacs, the GNU Compiler Collection, and the GNU Debugger. He co-founded the League for Programming Freedom in 1989. Waterloo, Canada. University of Waterloo. Hagey Hall Theatre of the Humanities, University of Waterloo, 200 University Avenue West. Richard Stallman will speak about the Free Software Movement, which campaigns for freedom so that computer users can cooperate to control their own computing activities. The Free Software Movement developed the GNU operating system, often erroneously referred to as Linux, specifically to establish these freedoms. This talk will be accessible to all audience and the public is encouraged to attend. Admission is free. I was made aware recently of your lecturing circuit and see that you will be in and around University of Waterloo. Have you heard of the PI Institute? I am no body and I operate under a pseudonym of Plato running a blog called, "Dialogos of Eide (http://eskesthai.blogspot.com/2008/10/white-space.html.)" As you know and I suspect you might be in agreement, ideas are cheap, but can become profound after giving an effort to it's actualization. I was draw to the idea of community, and to this end, this letter is about that. I write this now for consideration and then ask, you if there is such a thing as to design the hardware under "this idea of yours" to advance the internet as a free access, instead of the piggy back that we can do from libraries and such. That we can extent this service beyond the place of business and help society connect in that whitespace. I am not advocating breaking any such laws but to make available this service that will unite the greater global community spirit in those areas where the spectrum will allow such connections. I am then advocating "the design to capture those signals in the whitespace" that has be an open territory for for the White Space Coalition. To this end, might we see where such a search feature as google might help toward that end knowing it's market increase can be reached as well in that development and reach of the Internet? If you feel there is potential in what I say in that letter, then write also to Richard Stallman (rms@gnu.org)and get your own "auto generated email." Perhaps you might be at the lecture, in and around Waterloo, on the dates above? Is this worth the effort to connect communities without exploiting the Whitespace for profited orientated ends? Think about it and maybe you can come up with some method here. You can get in touch with me( platohagel@gmail.com) using my gmail account. I presented an earlier comment to set the stage for the understanding what happens when privatization takes hold of a country in terms of a commodity price fixing and how this is used against it's citizens by charging amounts that are beyond families to support themself, based on the wages of that country. 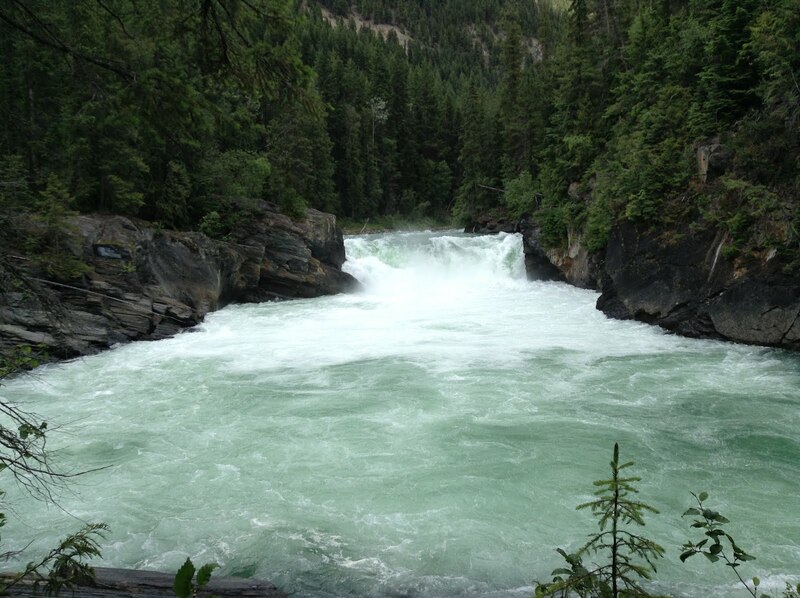 Water will be a issue too, along with the resources that are needed to help 300 million people. 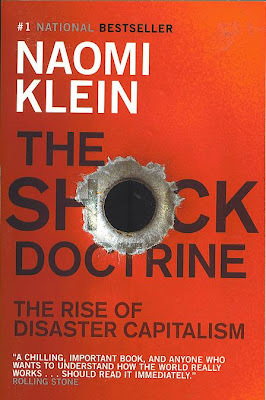 If you seen the signs within your own country how shall you not know to what extent capitalism will try and gain a foothold and in an environment that is conducive to the business exercising it's control of the population of another country, like the U.S. multinational Bechtel did? In South America, private companies have taken over municipal water supplies in at least half a dozen countries, but there's one city where the takeover didn't go as planned. In 1999, a consortium, controlled by U.S. multinational Bechtel, signed a 40-year deal to increase water supplies and services to Cochabamba, Bolivia. Six months later, rioting Bolivians chased the company out of the country. I wonder if "a scientist" can distinguish and combat this ruse in a "new model of economic formation principles," which actually represents all people? Instead of knocking off it's leaders and destabilizing governments to accomplish that transformation? You can never realize the scope of the problem when you see Nafta? can have "reactions from forming," then, a formation of the EU, then, talks to begin to unite both(scheduled appointment while Harper was being elected), while there are "counter formations" because of that. "EU to sends ships" to the fend off the Somalian pirates? What's happening on the global scene? Removing borders has to be seen in it's true light first, then, what is thought to be individual "is more then one" in defending against an open right to exploit other countries resources under capitalistic freedoms. So early on I told someone that it was a time of reflection, that such a recession would spark people to take an accounting of their situations, and in that process new reformations were to take place. I was accused of fear mongering, by seeking to add to the idea of something that was coming regardless of my saying that such times are indeed times of reflection and an accounting goes on in the household. It is not unlike the recession, to see implemented avenues that are part of the "current ruse" to make people aware that such processes were dealt with before, and that such accounting by Paulson was to institute things that were done, or not done in that time of 1929. IN this case it was mortgages that were frivolously given out to a system that was bound to fail because foreclosures. The process is one I am well aware of, and such example given as to CHMC housing insurances in Canada are a case in point to remember. Introduction-Blank is Beautiful: Three Decades of Erasing and Remaking the World1 Bud Edney, "Appendix A: Thoughts on Rapid Dominance," in Harlan K. Ullman and James P. Wade, Shock and Awe: Achieving Rapid Dominance(Washington, DC: NDU Press Book, 1996, 110. You must know there is a reason that I am showing these articles just to provide consideration and will put up some information here soon that deals with this point. I would say I do and am always impressed by Lubo's candidness, so I do not derive any solution to this process and it remains a troubling aspect of my research. The counter argument I produce I had discovering along the way to provide an example in a comment section that deals with what I am saying to Zephir here in this blog entry, under the idea of the landscape. I would ask that Lubos look a little closer and speak to the idea of the Landscape even though under the tutelage of Tom Banks, he specifics his reluctance. You must also know that I do not align myself with any current research model( disaster scenarios specific LHC.Org) other then to say I recognize facets "of this thinking from my own research" and that this presentation speaks to that. If there is no math involved then how can it represent the landscape in thinking? 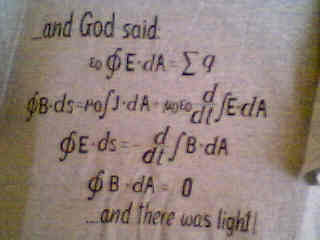 Logical conclusions, follow logical math processes in String theory? Letting our minds be consoled with the understanding that cosmic particle collisions take place on earth is the point I am making about seeing "the sun in gamma" and understanding that such measures allow us to see this way. It also helps us to understand that such a location(microscopic blackholes) allows information to travel faster then light in the medium of earth, so that we understand that things can travel "through and tunnel." Information is conserved. A supercritical fluid is any substance at a temperature and pressure above its thermodynamic critical point. It can diffuse through solids like a gas, and dissolve materials like a liquid. Additionally, close to the critical point, small changes in pressure or temperature result in large changes in density, allowing many properties to be "tuned". Supercritical fluids are suitable as a substitute for organic solvents in a range of industrial and laboratory processes. Carbon dioxide and water are the most commonly used supercritical fluids, being used for decaffeination and power generation respectively. For explanation of these animations see: The behaviour of dense particle systems. 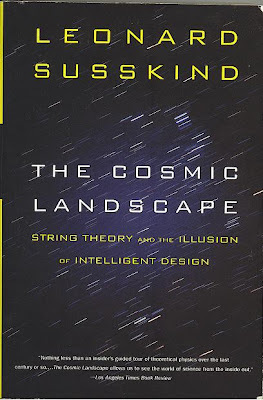 Are Strings as Spacetime an Emergent Phenomena? 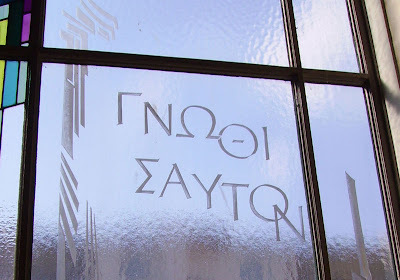 A stained glass window with the contracted version γνωθι σαυτόν. The saying "Know thyself" may refer by extension to the ideal of understanding human behavior, morals, and thought, because ultimately to understand oneself is to understand other humans as well. However, the ancient Greek philosophers thought that no man can ever comprehend the human spirit and thought thoroughly, so it would have been almost inconceivable to know oneself fully. Therefore, the saying may refer to a less ambitious ideal, such as knowing one's own habits, morals, temperament, ability to control anger, and other aspects of human behavior that we struggle with on a daily basis. It may also have a mystical interpretation. 'Thyself', is not meant in reference to the egotist, but the ego within self, the I AM consciousness. 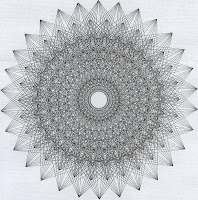 "[Geometry is] . . . persued for the sake of the knowledge of what eternally exists, and not of what comes for a moment into existence, and then perishes, ...[it] must draw the soul towards truth and give the finishing touch to the philosophic spirit." IN The Era of Quantum Gravity, will we be destitute? Given the idea that there is an original version to what is constituted as reality and attempts to describe it are really, "Births by approximation." Now you have to understand the previous blog posting by this name to understand that I presented supernovas and remnants as a illustration of what happens when we see the universe by itself, is laid out before us, while within that time frame (universe's birth to present), events have happened that are defined as Supernovas. Several types of supernovae exist that may be triggered in one of two ways, involving either turning off or suddenly turning on the production of energy through nuclear fusion. After the core of an aging massive star ceases to generate energy from nuclear fusion, it may undergo sudden gravitational collapse into a neutron star or black hole, releasing gravitational potential energy that heats and expels the star's outer layers. Now in terms of what we now know in what has been demonstrated by being lead by scientific process, a realization that such events as "the Spherical cow embeds parts of the universe in expression." We now know that such a view in terms of 13.7 billion years in the universe's age, has elements within it that are aged as well which should not exceed the age of the universe? 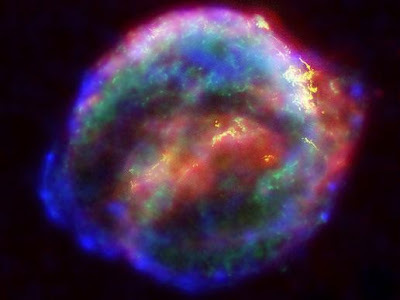 How does gravity occur in the totality of the whole universe, for it not to be the same, as the Supernova unfolds. The event itself and the resulting explosion has to have a basis in terms of geometrics. What shall we call these Supernovas when their previous existence may have been a blackhole? What do we call stars that collapse that make blackholes. Stars shine by burning hydrogen. The process is called nuclear fusion. Hydrogen burning produces helium "ash." 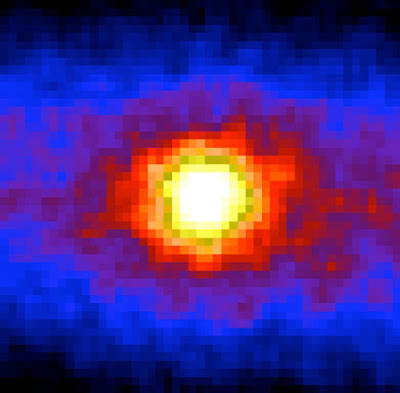 As the star runs out of hydrogen (and nears the end of its life), it begins burning helium. The ashes of helium burning, such as carbon and oxygen, also get burned. The end result of this fusion is iron. Iron cannot be used for nuclear fuel. Without fuel, the star no longer has the energy to support its weight. The core collapses. If the star is massive enough, the core will collapse into a black hole. The black hole quickly forms jets; and shock waves reverberating through the star ultimately blow apart the outer shells. 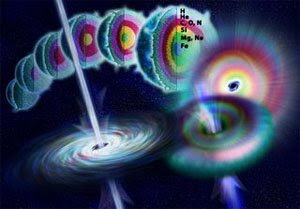 Gamma-ray bursts are the beacons of star death and black hole birth. Bold emphasis to encourage a conclusive realization about the classification of those events within the universe given to Gamma recordings in our measures. A year ago scientists thought they had figured out the nature of gamma-ray bursts. They signal the birth of black holes and traditionally, fall into one of two categories: long or short. 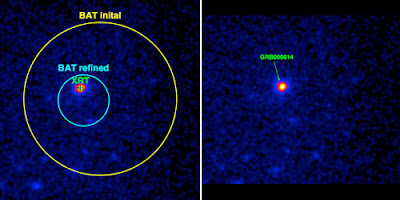 A newly discovered hybrid burst has properties of both known classes of gamma-ray bursts yet possesses features that remain unexplained. The long bursts are those that last more than two seconds. It is believed that they are ejected by massive stars at the furthest edge of the universe as they collapse to form black holes. Sometimes it is important to be able to see in the context that mountains can hold for other people. These people are living in a world "a little perceptibly" different then our own. So what do I mean by this? First off, where is this picture taken? Some of us will never know, or, we might come across something that will trigger a recognition. 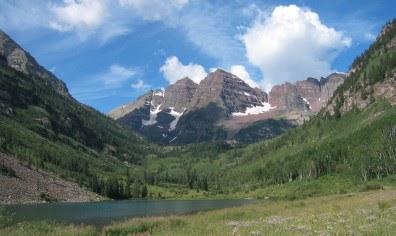 Few of us lay people will ever visit or travel too that place in Aspen, for the reasons such a gathering will take place. Those of his specific profession may pilgrimage there every year, or maybe, not at all. So let me say that before I ever met the "notion of the landscape" here, I had my own values about the nature of the world I live in. The mountains, through my own studies were sacred places that I had come to recognize through my journeys into the Native American beliefs. I recognized these mountains through recognition of my own religious up bringing. Through Myth. Maybe you have your own picture that you can use to illustrate what is being implied here? This is the unfortunate thing about being the lay person, and working from the information we read and attempt to put it together in our own minds. It is right? Just trying to make sense of it. It may seem like noise to the profession, but it is by all standards "a birth of an approximation." While such walks may impart certain feelings within individuals, I can't help but see this symbolism transferred to a "higher mental abstraction" that once engaged "in a mathematics of kind" would proclaim itself as a "perspective over the world" before them. As they stand on that mountain top. This then that mountain top is the "initial state." Birth by Approximation. From this perspective, the universe came into being. Down there in the valleys "is" the universe in expression. Down there, is the Earth. If only I was a painter.....what would this perception of mine look like? I could not help but point out that part of understanding the nature of the expression of the landscape is to see it from the author/painter's perspective. How shall one translate to verbal expressions an understanding which shall leave no doubt as to it's substance. It's nature in the world of expression. The use of my words and colours? Travel then into the past, and look at the link. From the Big Bang through the present day and well into the future, matter and dark matter in the universe is concentrated in stars, galaxies, and galaxy clusters. Therefore, the universe is not in thermodynamic equilibrium and objects can do physical work., §VID. The decay time of a roughly galaxy-mass (1011 solar masses) supermassive black hole due to Hawking radiation is on the order of 10100 years,, so entropy can be produced until at least that time. After that time, the universe enters the so-called dark era, and is expected to consist chiefly of a dilute gas of photons and leptons., §VIA. With only very diffuse matter remaining, activity in the universe will have tailed off dramatically, with very low energy levels and very large time scales. Speculatively, it is possible that the Universe may enter a second inflationary epoch, or, assuming that the current vacuum state is a false vacuum, the vacuum may decay into a lower-energy state., §VE. It is also possible that entropy production will cease and the universe will achieve heat death. Of course I am acknowledging the universe in a big way here, "that by measure," we can arrive at "some ideas" about the nature of this universe. Fundamental constants acknowledged. This post was to raise awareness of the "idea about noise that can be created by people," layman like myself, as to questions we can have about the universe's birth. How can I be more specific? While these questions are not specific to an analysis of the way and approaches in experiment at the forefront, or theoretics, I can wonder and do voice from "information specific as lead by science" that the "science trades embedded" are in the analysis, and am working toward this resolution of a "factual and actual representation." There is an assumption on my part that gravity existed "before this universe" and "came into expression" as this universe. How does one qualify this statement? I do not discount that I was lead here by Veneziano. I do not discount and acknowledge an astronomer would be happy with just accepting the universe as the way it is, in a nice box. But yes, I too think outside the box in more ways then one. :) Shall I not acknowledge, such heat generated in my thinking mind may propel new universes in idea expression? These are just two of the measures below that have, and will, allow us to interpret the very outlay and expression motivated, as it is. The temperature (TT) and temperature-polarization correlation (TE) power spectra based on the 5 year WMAP data. Additional data provide more sensitive measurements of the third peak in TT and the high-l TE spectrum, especially the second trough. Now, I develop this post knowing that Clifford and Robert and Sean, look to discuss respectively and abstractly Boltzmann Brains, gravity inherent, a description of the universe at large. That some work from "purely abstract levels in mathematics." It is not always certain and clear for me how this math is deduced, but from holding "bench marks of the constants" as an progression to further questions. Future theoretics. 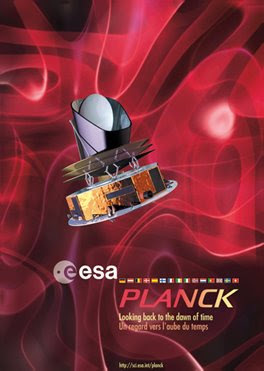 Planck will help provide answers to one of the most important sets of questions asked in modern science - how did the Universe begin, how did it evolve to the state we observe today, and how will it continue to evolve in the future? 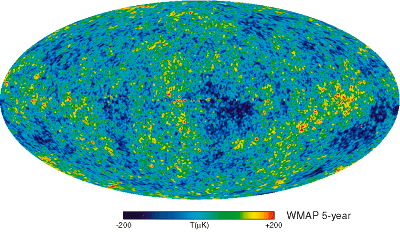 Planck's objective is to analyse, with the highest accuracy ever achieved, the remnants of the radiation that filled the Universe immediately after the Big Bang, which we observe today as the Cosmic Microwave Background. As a layman I find this of particular importance when we send our vision out amongst the stars, all the while looking at the substance of these events "within the larger context of the universe." While each particular event is revealed through Chandra's catalogued linked below it helps me to see them within that universe as well as think of them in terms of "this singular event" as shown in the Crab Nebula. 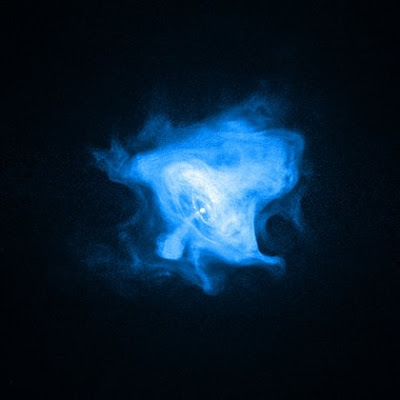 This image gives the first clear view of the faint boundary of the Crab Nebula's X-ray-emitting pulsar wind nebula. The nebula is powered by a rapidly rotating, highly magnetized neutron star, or pulsar (white dot near the center). The combination of rapid rotating and strong magnetic field generates an intense electromagnetic field that creates jets of matter and anti-matter moving away from the north and south poles of the pulsar, and an intense wind flowing out in the equatorial direction. The inner X-ray ring is thought to be a shock wave that marks the boundary between the surrounding nebula and the flow of matter and antimatter particles from the pulsar. Energetic electrons and positrons (antielectrons) move outward from this ring to brighten the outer ring and produce an extended X-ray glow. The fingers, loops, and bays in the image all indicate that the magnetic field of the nebula and filaments of cooler matter are controlling the motion of the electrons and positrons. The particles can move rapidly along the magnetic field and travel several light years before radiating away their energy. In contrast, they move much more slowly perpendicular to the magnetic field, and travel only a short distance before losing their energy. This effect can explain the long, thin, fingers and loops, as well as the sharp boundaries of the bays. The conspicuous dark bays on the lower right and left are likely due to the effects of a toroidal magnetic field that is a relic of the progenitor star. Now of course, when I read on how the astronomers approximate, it was as if I was watching it from a view, and all of this is on stage. What was in my thinking before this is what I had done naturally anyway, since such regions of the universe has these places as part of the larger context. How they contribute to the universe at large, just seem to be part of the geometrical evolution of the event for me and was part of the effort to explain in this geometrical unfolding. Thusly, the impetus for information of these events were part of the motivation factors that are driven. It left to us to see "the nature of these places," in our universe which allowed us a portrayal of the elements in a dissipative and degenerative energy expenditure, as fore tellings of a further geometrical inclination. The idea here then is that gravity does not emerge from the "substance of the neutrinos," but happens much earlier. It happens with the "geometrical inclination within the confines of the universe." If, the total universe is an expression of the same geometrical inclination as an event, then, "every event that happens within universe," either contributes to the inflationary aspect, or, it does not. If the numbers of events "exceed the universe" then those events contribute to a "speeding up" that can occur? It is "the geometrical action itself" that presents the gravity waves to our location here on earth. It is not to be thought of as earth as any central sun located but an object placed or event, that sits in the universe, and can measure the gravitational waves as they pass these locations. Other Images of X-ray sources that allow us to ponder the nature of expression "in the approximate" using the Spherical Cow in relation.